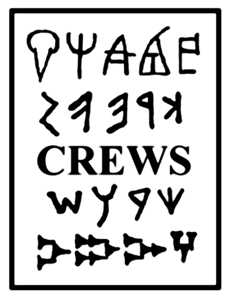 Reminder: Opportunity to join the CREWS team! Just to remind you that there is a bit more than a week left to submit applications for the second Research Associate post on the CREWS project (deadline 21st November). See more HERE. Like the first Research Associate post, this has a fixed term of four years, beginning in March (or at the latest 1st April) 2017. Again the successful applicant will conduct research on a pre-determined aspect of the project, in this case the development of writing systems used to write North West Semitic languages in the second and early first millennia BC. This will involve using a variety of methods to study Ugaritic, Phoenician and related writing systems with a view to developing our understanding of their inception, structure and usage. This may include, for example, comparison of their sign inventories in relation to the phonological systems they represented, analysis of palaeographic variation, typological study of inscribed objects and consideration of features such as alphabetical order and direction of writing. The closing date is 12.00 noon (GMT) on Monday 21st November. Please consult the Further Particulars, which can be found from the page linked to above, for more details on how to apply. We are looking forward to welcoming a new member to the CREWS team! CREWS News: New team members! Finally the time has come for the exciting project news that I have been waiting to tell you all about! I am delighted to announce that the CREWS project is welcoming two new team members. Dr Philip Boyes will be joining the team on 1st November as a Research Associate, and will work on the social context of writing at the Late Bronze Age city of Ugarit. Coming from a background of Levantine history and archaeology, the project will benefit greatly from his interdisciplinary approach to developments in writing and their relationship with other sorts of social change. Natalia Elvira Astoreca just joined the team a few days ago as the project’s PhD student, and is going to be working on the early development of the Greek alphabet. With previous experience of research on Cypriot writing and Greek epigraphy, she is going to consider questions such as why and how the early Greek alphabet displayed such a high degree of regional diversity, and how it was related to other alphabetic systems. I am very excited to be working with Philip and Natalia, and looking forward to see the project grow and develop as we conduct our research together. In the meantime you can read about Philip and Natalia on the project’s ‘About’ page HERE. We will be back soon with more posts about writing in the ancient world, including one from Philip introducing his research. Fun times are ahead for the CREWS project! This one is just to remind anyone interested in applying that we are currently advertising for a Research Associate on the CREWS project, with a deadline of 1st August. Please see the previous blog post on this topic for more information: CREWS Research Associate Post. The successful applicant will conduct research on a pre-determined aspect of the project, namely the context of writing in ancient Ugarit, specifically the social and cultural background against which the innovation of a new writing system took place. S/he will also conduct comparative studies, comparing the context of Ugarit with that of other examples of contemporary or near-contemporary written culture (for example in the Near East, Anatolia, Cyprus, the Aegean, Egypt); the choice of comparanda may depend in part on previous research experience. S/he will take up the post on 1st October 2016 or as soon as possible thereafter, and will work on the project for four years. For more information, you may visit the link above or click HERE to visit the University’s job listing. The closing date for applications is 12.00 noon (BST) on Monday 1st August 2016. This is a fully funded studentship, and the successful candidate will begin a PhD on the early development of the Greek alphabet in October 2016. Interested parties should read in detail the information given on the page linked to above, which explains the application process. Please note that due to restrictions of funding, the studentship is open to UK/EU nationals only.